Walter Benjamin said that you have to “organise pessimism”. 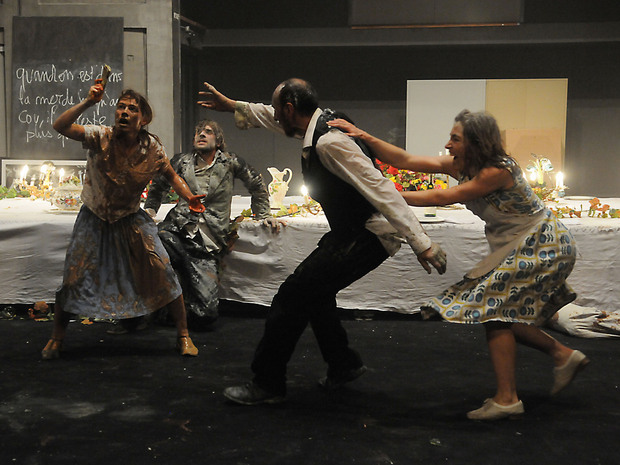 “This means working on bringing forth resistant diagonal forces, sources of priceless moments that outlive fading memory…” says Maguy Marin, choreographer of ‘Salves’. A lady who dares to take risks in mixing dance and theatre, Maguy has been sucessfully blending the two for over thirty years. Now heading up the Centre Chorégraphique National de Rillieux-le-Pape, this latest creation – universally acclaimed as a masterpiece – is a ‘manifesto, a hail of gunfire, in which images shatter and fury overcomes despair. A salutary salvo of lightning in the night’. Part political manifesto, Salves condenses Marin’s career and her incredible vision of choreography with a masterful touch. Like a painting, an epic poem, this piece is a sequence of images, flashes from the darkness, which show us the folly of the world. A piece of calculated chaos, with a huge rhythmic score for seven performers and long-time collaborators.